Paper can be used for a lot of things, including origami—and in ancient Asia, where paper was invented, one netizen has created some amazing paper folding art! 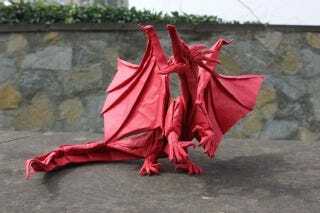 Currently spreading around the Chinese interwebs thanks to folks at China Players (and Sina), these origami creations are the work of one Baidu message board user called 鈬鍢鋃銘鎶. Altogether they've created more than seventy different origami pieces. Here, we've collected some of the better creations for your viewing pleasure! The level of detail on some of these are incredible.